Then, we welcome Peter Filkins back to Writer’s Voice; we’ve spoken with him before about his translations of the works of H.G. Adler. Now, he tells us about his biography of Adler, H.G. ADLER: A Life in Many Worlds. Damion Searls first came to the attention of the general public for his translation of the novel Comedy In A Minor Key, by German-born Dutch writer Hans Keilson. First published in 1947, the novel had been unavailable in English until Searls translated it in 2010. 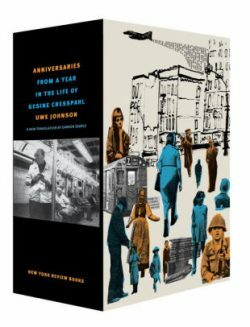 Now, Searls has come out with another translation of a German novel that took decades to appear in English, Uwe Johnson’s ANNIVERSARIES: From a Year in the Life of Gesine Cresspahl (New York Review Books Classics). This remarkable book, in a two volume set running to 1700 pages, has been getting rave reviews. Anniversaries tells the story day by day of a year in the life of its protagonist, Gesine Cresspahl, a single mother come to America from East Germany in 1967. It is about war, memory, immigration, totalitarianism and the struggle to find truth in a world where ideology seeks to trump it. Damion Searls is a translator from German, Norwegian, French, and Dutch and a writer in English. He is the author of a book on the Rorschach test, and has translated many classic modern writers. Peter Filkins has been on our show several times to talk about his translations of the works of German writer H.G. Adler. Adler was the author of the most famous study of Theresienstadt, the Nazi concentration camp where he spent three years before being sent to Auschwitz. He also wrote three autobiographical novels that Filkins has brought to English language readers: Panorama, a coming of age story; The Journey, about Adler’s experience in Theresienstadt, and The Wall, about his post war life in London. 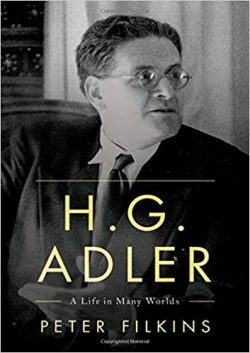 Now, Peter Filkins has written a fascinating biography of Adler, H. G. Adler: A Life in Many Worlds. It’s the story of a generation and of a world now lost to one of history’s darkest chapters, as well as of a mind that saw how history was shaped by social forces that are still threats today.